We were proud to be a sponsor of this year’s Passive House Northwest Conference. 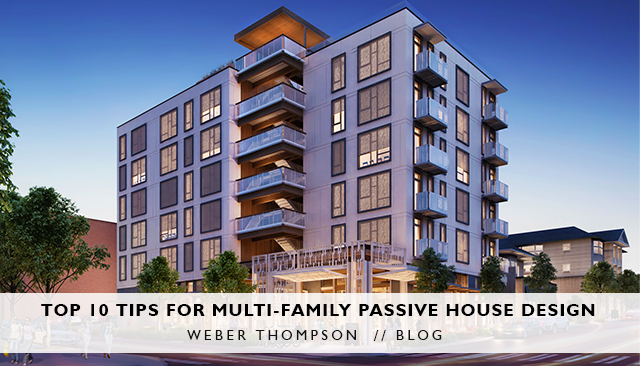 Once again, the logistics of Passive House for multifamily projects were validated. For a 3-5% cost premium, using industry standard assemblies, multi-family passive house projects can achieve substantial benefits. These include: superb indoor air quality that has been linked to measurable health benefits, unparalleled thermal comfort, a quiet interior, and, last but not least — ultra-energy efficiency. The typical multifamily Passive House building uses 70% less energy than a national code-compliant building and 50% less energy than a comparable Seattle building. This is doable! Here are our top ten tips for pursuing this standard. 1. Make Passive House a goal early in the design process. The sooner it is recognized as a project goal, the better it can be integrated into all aspects of the design. 2. Onboard the right team from the beginning. Especially the owner, architect, contractor, mechanical and energy modeler. 3. Set Passive-House boundary. Get buy-off from PHIUS on a boundary that makes sense for the project if mixed-use. There is flexibility here, especially in a dense urban area where the success of ground floor retail is a high priority and owners do not want to put restrictions on future tenants. 4. Simplify building geometry. This limits the ratio of conditioned floor area to exterior wall area and also greatly simplifies the detailing of the air barrier and thermal continuity. Stack units whenever possible. 5. Limit vertical continuity between floors. Stairs, elevators, and shafts are notorious locations for air leakage and stack effect pressures making a tight air barrier more difficult to accomplish; consider running these outside of the thermal envelope. Since unconditioned area doesn’t count towards floor-area-ratio (FAR), this strategy also helps maximize developable FAR! 6. Use industry-standard building assemblies whenever possible. This will maximize competitive subcontractor bids which will help keep costs down and the schedule on-track. 7. Strategize for solar heat gain. Densely packed units hold in excessive heat. Cooling from solar heat gain can be one of the biggest energy demands. Since building massing/form and orientation is often inflexible on urban multifamily sites, it is crucial to identify a strategy for managing solar heat gain early in the design progress. 8. Clarify fire ratings. Openings in fire ratings can be especially tricky given the current selection of door, window and access panel products. It is possible to find products that meet Passive House air leakage requirements or fire rating requirements, though few meet both. 9. Limit penetrations to the PH envelope. Run unit supply and exhaust internally and combine penetrations whenever possible. Consider using condensing dryers instead of conventional, as they do not need a vent to the exterior, or plan for a communal laundry room. Run roof drains and other HVAC shafts externally whenever possible. 10. Leverage design features for multiple functions. Balconies can double as fixed shading devices. 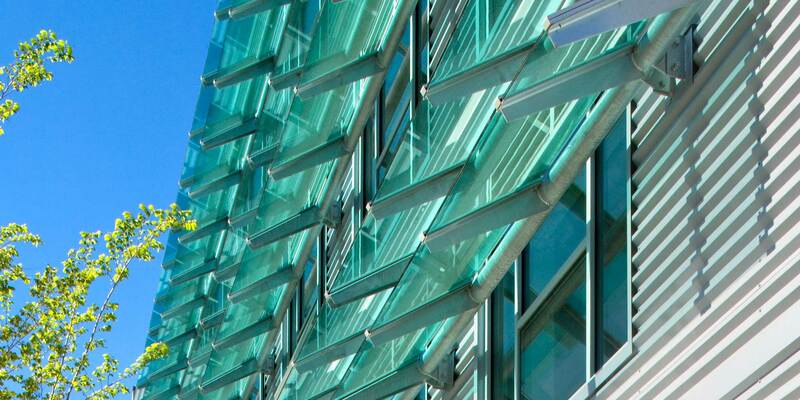 Exterior roller shades provide façade texture and dynamic shadow lines. Exterior circulation can provide outside amenity space. Emily is a Senior Associate and brings a dynamic and detail-oriented work method to all phases of design. She became a Certified Passive House Consultant in 2017.